I have always traveled spontaneously and, as my children like to say, “by the seat of my pants.” That’s all well and good, going from place to place with my nose in a guide book as I try to figure out where to stay and what points of interest to visit, but more and more I find that my travel experience is richer when I delve into the culture and history of an area before arriving. Obvious, you say. Not so for the majority of travelers. They get so caught up in the details of what to take and how much—plus shots, money, visas–that they lose sight of the fact that they will be faced with a new culture, a new set of rules, and very likely—if they go off the beaten track—with the need to know the rudiments of a new language. And, folks, that’s the real fun of it! I found a rather obscure book about Burma, or Myanmar, before visiting that country in 2007. I ended up with a respect for its rich and troubling history that no guidebook could possibly convey. It talked about the democracy movement and the years of upheaval under British rule, and the conditions leading to the present repressive government. It made me eager to talk with the people, and gave me some knowledge of their struggle far above the tourist sampling of temples and monuments. I’ve been doing the same for my upcoming trip to the Grand Canyon and adjacent national parks with my two grandsons this June. They’re young and eager to know about the geological and early American history of these rugged lands loaded with Native American history and the amazing adventures of the first settlers. It will not be the pristine experience so beautifully documented by Ken Burns, for it’s summer and the whole world heads West to our national monuments. But it will be more than just pretty pictures of rock formations. It will be the unfolding of a special place in this great land that is unique in our history and worth our reverence and respect. So my simple rule #6 is to spend some time at your local bookstore or library and steep yourself in whatever place you’re visiting. Don’t try to cover the waterfront…take one country at a time and dig deep. Know something about their leaders, their writers, their customs. You will be rewarded by a new appreciation of your fellow human beings, wherever they live, and your eagerness and willingness to learn about them will be met with open arms. Trust me. A word to the wise to young women, especially, who have come of age in an American society where just about anything goes, including exposed belly buttons, mini-skirts, and skin tight T’s and jeans. This applies as well to young men who like to hang their baggy pants halfway to their knees, caused, they say, by forgetting to put on a belt. Not only is that sloppy, but it gives a vulgar impression of America, which may seem an old-fashioned thing to say, but take it from a world traveler, it doesn’t help you if you want to win friends and get to know another country. And those low-cut T’s are especially inappropriate in countries like India, where most of the men are trying to “make you happy” anyway. Don’t make it worse, especially if you’re a single woman. They’re fair game, as I’ve said many times before from personal experience. And age makes no difference. In Asia, older is better. That’s nice, but it can have its drawbacks. I’m going mad with preparations for an exciting and challenging summer in New Hampshire, Whidbey Island, and Vancouver Island, but I did manage to see a few of Broadway’s best. Top of the list, and a birthday present from Paul Sharar, is Red, the new play about the painter, Mark Rothko, starring the superb Alfred Molina and newcomer Eddie Redmayne. Don’t miss it. It was also a treat to visit with my former daughter-in-law, Andrea Giammattei, with whom I saw White”s Lies, not the greatest drama, but it starred Andrea’s old teacher, Betty Buckley, who is always a delight to see. Once again I saw God of Carnage, and enjoyed the new cast: Janet McTeer, who was so powerful in the classic Mary Stuart last season, Jeff Daniels, who played a different role this time around, Lucy Liu, and Dylan Baker. This time I took Judy Wyman and grandson Thomas Bixler. If I really like a show, I want to share it. It’s my weakness and my joy. Just for fun I’m posting some photos of my grandson, Thomas Bixler, who has spent the last few days sealing my back deck, pulling weeds, and refurbishing the wrought-iron railing in front of the house. After all, what are grandchildren for? It’s quite an experience supervising a close relative, especially one who sees no reason why drops of brown primer are unattractive on cement pedestals and sidewalks. So much easier than fiddling with drop clothes. It was fiery at times, but fussy grandmothers usually win, and it’s nice that children are so forgiving. I’ve decided to trade perfection for good company. Can anything be accomplished without an iPod? 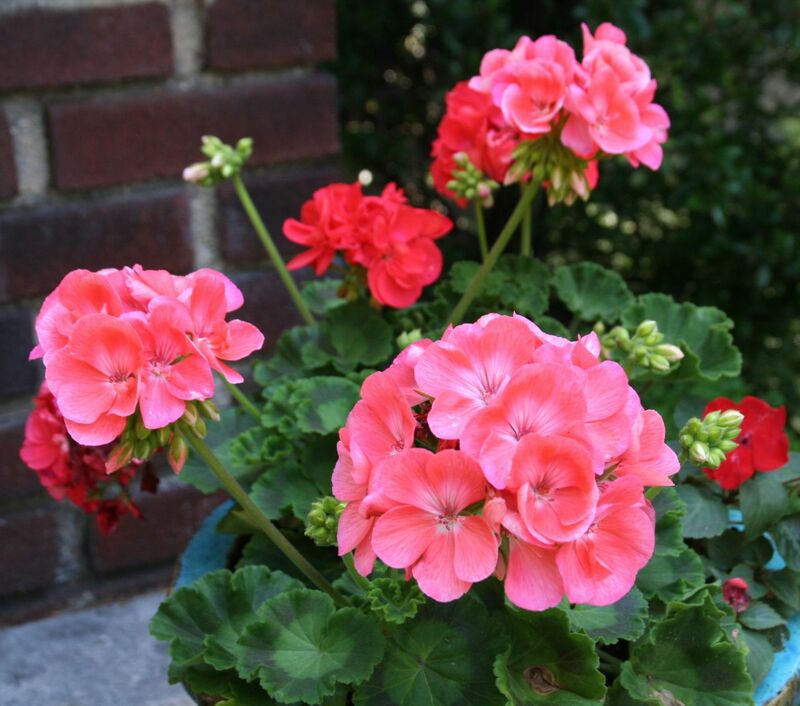 are always coriopsis, spirea, salvia, and a host of geraniums.